Earlier this year, we added the ability to “Upload any file” to Google Docs so that you upload, store, and share any file up to 1 GB in size. Now you can upload new versions of the same file to your document list. Previously, each time you updated a file, you would have to upload the new version as a new file with a new URL, re-share it, and put in the correct folders again. When you select the “Add or manage versions” option on any file, you can upload new versions of a file, download previous versions, and delete older versions. 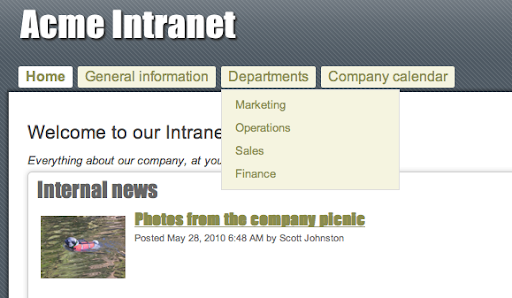 Sometimes, you want to group information using drop downs and now you can by going More actions > Manage site > Site layout. Back in June, we made sharing easier in Google Docs. Today, we extended this simplified sharing experience to Google Sites, unifying the sharing experience across Google Docs and Google Sites. 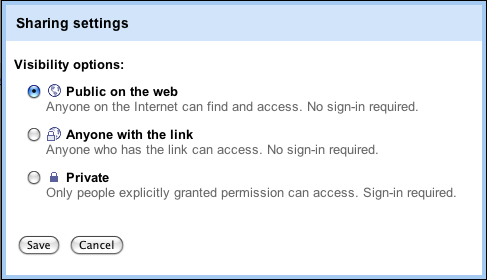 As with Google Docs, Google Sites now be set to one of three visibility options: private, anyone with the link, or public on the web. The new visibility option is always available at a glance at the top of each site. With this update, the new “Anyone with the link” setting makes your site available to anyone that knows the unique URL, but blocks search engines from indexing the site. And for those times that someone sends you a link to a site but you don’t have access, you can now request access to that site from the access denied page. As always, we’d love your feedback and if you have any questions, please check out our document list and Google Sites help pages. Two big advantages of building web applications are frequent feature releases and easier cross-product sharing. Today we have a little of both for you. This week, we are adding version history to uploaded files in the documents list as well as drop downs in horizontal navigation and a new sharing experience to Google Sites.